Brian Isett, who is now at Carnegie Mellon, has kindly shared the following tutorial regarding the creation and implementation of a Rodent Running Disk he designed while at University of California, Berkeley. “Awake, naturalistic behavior is the gold standard for many neuroscience experiments. Increasingly, researchers using the mouse model system strive to achieve this standard while also having more control than a freely moving animal. Using head-fixation, a mouse can be positioned very precisely relative to ongoing stimuli, but often at the cost of naturalism. One way to overcome this problem is to use the natural running of the mouse to control stimulus presentation in a closed-loop “virtual navigation” environment. This combination allows for awake, naturalistic behavior, with the added control of head-fixation. A key element of this paradigm is to have a very fast way of decoding mouse locomotion. The tutorial may be found here. Isett, B.R., Feasel, S.H., Lane, M.A., and Feldman, D.E. (2018). Slip-Based Coding of Local Shape and Texture in Mouse S1. Neuron 97, 418–433.e5. The de Bivort lab and FlySorter, LLC are happy to share on OpenBehavior their open-source Drosophila handling platform, called MAPLE: Modular Automated Platform for Large-Scale Experiments. Drosophila Melanogaster has proven a valuable genetic model organism due to the species’ rapid reproduction, low-maintenance, and extensive genetic documentation. However, the tedious chore of handling and manually phenotyping remains a limitation with regards to data collection. MAPLE: a Modular Automated Platform for Large-Scale Experiments provides a solution to this limitation. MAPLE is a Drosophila-handing robot that boasts a modular design, allowing the platform to both automate diverse phenotyping assays and aid with lab chores (e.g., collecting virgin female flies). MAPLE permits a small-part manipulator, a USB digital camera, and a fly manipulator to work simultaneously over a platform of flies. Failsafe mechanisms allow users to leave MAPLE unattended without risking damage to MAPLE or the modules. The physical platform integrates phenotyping and animal husbandry to allow end-to-end experimental protocols. MAPLE features a large, physically-open workspace for user convenience. The sides, top, and bottom are made of clear acrylic to allow optical phenotyping at all time points other than when the end-effector carriages are above the modules. Finally, the low cost and scalability allow large-scale experiments ($3500 vs hundreds of thousands for a “fly-flipping” robot). MAPLE’s utility and versatility were demonstrated through the execution of two tasks: collection of virgin female flies, and a large-scale longitudinal measurement of fly social networks and behavior. ArControl: Arduino Control Platform is a comprehensive behavioral platform developed to deliver stimuli and monitor responses. This easy-to-use, high-performance system uses an Arduino UNO board and a simple drive circuit along with a stand-along GUI application. Experimental data is automatically recorded with the built-in data acquisition function and the entire behavioral schedule is stored within the Arduino chip. Collectively, this makes ArControl a “genuine, real-time system with high temporal resolution”. Chen and Li have tested ArControl using a Go/No-Go task and a probabilistic switching behavior task. The results of their work show that ArControl is a reliable system for behavioral research. Airtrack was developed in LARKUM Lab by Mostafa Nashaat, Hatem Oraby, Robert Sachdev, York Winter and Matthew Larkum. Alexander Schill, engineer at Charité workshop (CWW) had a significant contribution to the design of the platform and the airtrack table. Airtrack is a head-fixed behavioral environment that uses a lightweight physical maze floating on an air table that moves around the animal’s body under the direct control of the animal itself, solving many problems associated with using virtual reality for head-fixed animals. Nashaat, MA, Oraby, H, Sachdev, RNS, Winter, Y, Larkum, ME. (2016). Air-Track: a real-world floating environment for active sensing in head-fixed mice. Greg Silas, from the University of Ottawa, has kindly contributed the following to OpenBehavior. The DropBox folder containing the python code may be found here. Click here to submit a piece of open-source software or hardware to OpenBehavior. Pearce Research group also provides an Open Source Lab page dedicated to low-cost, open-source lab hardware. Wijnen, Bas; Hunt, Emily; Anzalone, Gerald; Pearce, Joshua (2014). Open-Source Syringe Pump Library. PLoS ONE, 9(9), e107216. 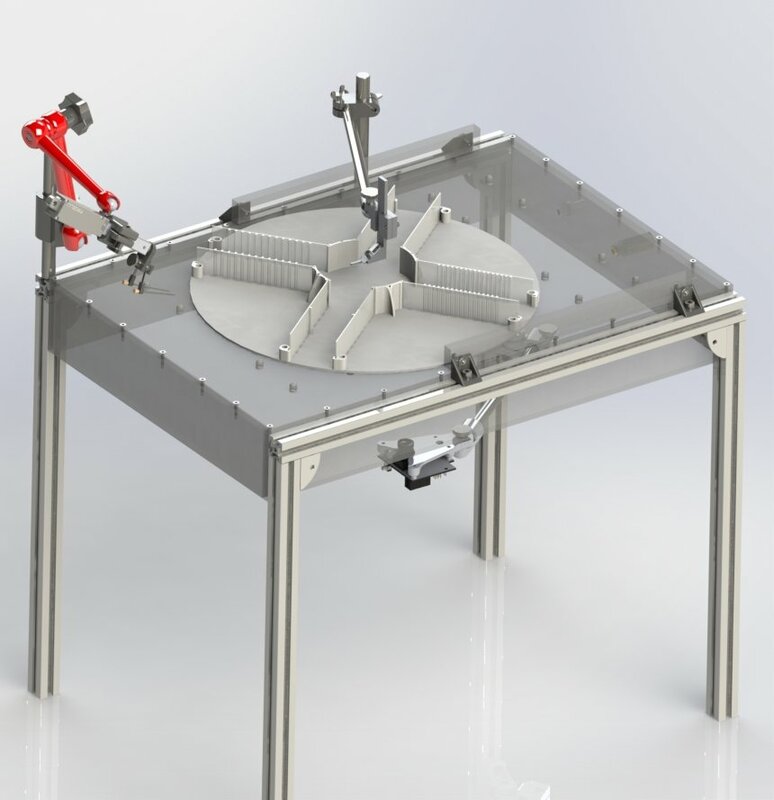 Feeding Experimentation Device (FED) is a home cage-compatible feeding system that measures food intake with high accuracy and temporal resolution. FED offers a low-cost alternative (~$350) to commercial feeders, with the convenience of use in tradition colony rack caging. In their 2016 paper, “Feeding Experimentation Device (FED): A flexible open-source device for measuring feeding behavior,” Katrina P. Nguyen, Timothy J. O’Neal, Olurotimi A. Bolonduro, Elecia White, and Alexxai V. Kravitz validate the reliability of food delivery and precise measurement of feeding behavior provided by FED, as well as, demonstrate the application of FED in an experiment examining light and dark-cycle feeding trends, and another measuring optogenetically-evoked feeding. KravitzLab has shared the Arduino scripts for controlling FED, as well as, the python code used to analyze the feeding data collected by FED on the KravitzLab Github. Additionally, build instructions and power considerations are detailed on the FED Wiki page and 3D Design Files provided through TinkerCAD. Nguyen, Katrina; O’Neal, Timothy; Bolonduro, Olurotimi; White, Elecia; Kravitz, Alexxai (2016). Feeding Experimentation Device (FED): A flexible open-source device for measuring feeding behavior. J Neurosci Methods, 267:108-14.